Is it technically still "pumpkin season" when Thanksgiving is over? You know, pumpkin spice season. Does it continue into the sparkly winter doldrums? I'm assuming coffee shops will still sell pumpkin spice stuff until the buds begin to show up on the trees in spring. And there will at least be an attempt to push pumpkin things for the winter holidays because there's just so much left over from Halloween and Thanksgiving. (Imagine all of the pumpkin shaped chocolates going to waste in the world. A crime.). I guess I'm on the same train. I have pumpkin on the brain (and cans of pumpkin in my cupboards) so I'm about to unload a big ol' round of pumpkin on this winter. So, ready or not, it's happening. Also, if you haven't seen SNL's spoof on the pumpkin spice scene you should watch it. right. now. It's certainly still winter squash season. There's a giant box full of kabocha, kuri, hubbard, butternut, and delicata on my kitchen floor so there's no question, there will be lots of squash in my life for the next three months. Whether I like it or not (and I love it, for now). I remember stumbling on a book in my parents library a couple of years ago that included excerpts from early european American settlers' letters and one read: "The winter has been long. If I have to look at another pumpkin I'm going to burn this freakin' cabin DOWN." Because, honestly, there is almost nothing more American than pumpkin everything. Pumpkin pie is way more OG than apple pie (because apples came from Mongolia originally!). And the early settlers essentially hunkered down with their firewood, piles of wool blankets, and stacks of pumpkin to wait out the worst of the cold. They had a much greater variety of pumpkins and winter squash than we can get now (thanks mono-crops, you're really great). So those pumpkin stacks weren't full of our varietally-specific, glowing, orange globes. But included a range of differently colored squashes, mostly hardy with thick shells, some knobby and warty, some large, some small. For a lot of folks pumpkin was the only thing standing between them and starvation. Stead of pottage and puddings and custards and pies Our pumpkins and parsnips are common supplies, We have pumpkins at morning and pumpkins at noon, If it were not for pumpkins we should be undoon. If those early settlers saw how people are celebrating pumpkin now I have a feeling we would have to smack them back from crazy town. But then, when they came to their senses, maybe they would pat us all on the back for making something quite nice out of what was really just a staple food back in the day. So, I found myself making this soup. And feeling thankful that my diet doesn't consist solely of squash and melted snow. The toasted chickpeas are a real treat on their own, as a snack. And the pumpkin soup is rich and nourishing -- with plenty of turmeric for an added anti-inflammatory boost (sometimes I just need a lil extra tonic power in my soup, ok?!). In other news my salted dark chocolate sandwich cookies got a mention by Buzzfeed this week in a vegan holiday cookie roundup! Oh, and congrats to all of the winners of last weeks Friendsgiving giveaways sponsored by J. Q. Dickinson Salt-Works! 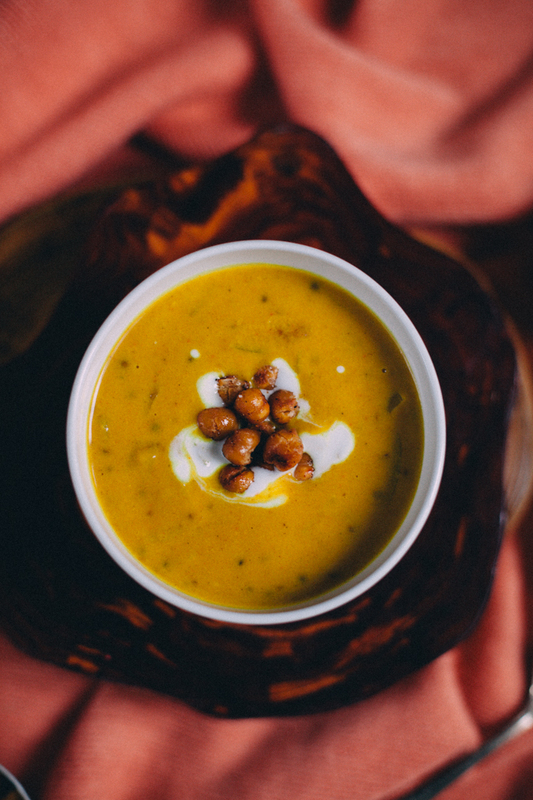 This rich, easy-to-make pumpkin soup is enriched with goat kefir and spiced with turmeric, cinnamon, and honey. A tangy-sweet, warming winter soup. The toasted chickpeas are great on their own as a snack, but make a great, spicy soup or salad topper. In a small soup pot over medium high heat, cook the diced onion until it starts to become transparent. Add ground coriander and cook until the onions begin to brown, about 5 minutes further. Add the bourbon and stir, cooking until it's evaporated. Stir in the pumpkin, water, and goat kefir. Add the turmeric, cinnamon, allspice, honey, and salt and cook until heated through. Serve immediately, with toasted chickpeas on top! While the soup is cooking, heat a 12" cast iron skillet or non-stick pan over medium-high heat. Drain the chickpeas and pat dry with a paper towel. Add the chickpeas to your pan. Cook until beginning to brown, stirring occasionally. My chickpeas took about 10 minutes before browning. Once the chickpeas are beginning to dry-toast, add the coconut oil. Fry for 5 to 10 minutes, until the chickpeas begin to get slightly crisp and brown further. Remove from heat and add the hot chickpeas to a medium bowl. Stir in the sea salt, maple syrup, and cayenne -- coating evenly. Eat straight or top off your soup with these babies!